The first thing that hits you about Sierra Leone is the heat – literally, as you step off the plane, smack! There it is! OK, I do come from the Shetland Islands in the far north of the UK where the temps lately have been a mild high of 5-9°C so that may be why the average temp of 30°C felt rather warm, but even so! It’s not much cooler at night either. I was on my second expedition with Operation Orphan. The first was a warm clothing distribution trip in Moldova. 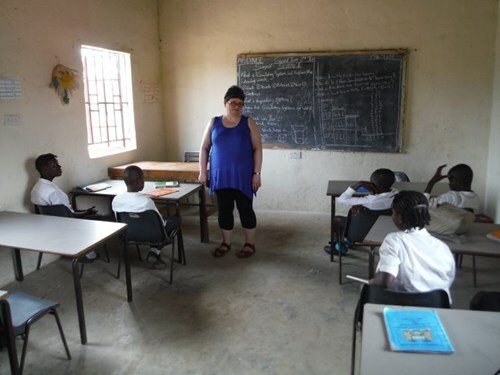 Sierra Leone was a bit different: working in the school and orphanage of Heaven Homes. There were just three of us; myself, a learning support worker and early years assistant; Cyrilyn, a teacher and also Operation Orphan co-founder/ director and Morag, a retired teacher. The school was set up to cater for the community, the homes came after, when demand for accommodation for Ebola orphans created the need. It was at this point Operation Orphan became involved, by providing funding for building the homes and caring for the orphans. Four homes have been built, two are lived in and the other two are nearly ready with the children living temporarily in a building the other side of the school. On our first day we went to visit the ‘aunties’ in the homes. These four amazing women provide 24/7 care to the 56 orphans in their care. The children include two relatively new arrivals who were abandoned and bring developmental problems into the mix with the Ebola orphans. The older children just accept them and carry them around, play with them – or ignore them, just like siblings the world over. We also met with school staff on that first day, to arrange training and get to know them a little. As we were taken around the school, pupils in each of the seven classes stood and welcomed us into their classrooms. The rooms mainly bare walls apart from the occasional poster, some handmade some printed, the children beaming smiles, excited to have visitors. I felt the teachers were wary of us at first but we became closer as the days went by and we were soon being invited into classrooms to observe, be entertained by songs, take classes and give examples of different ways of doing things. We did a day of teacher training with all the staff and I spent a lot of time in the nursery showing the teacher how learning through play could take place and sharing with her the resources we took out with us. 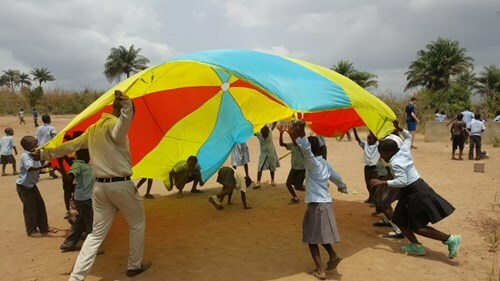 Not sure how sensible learning parachute games or the Hokey Cokey in full sun is though! When working in the school we found out how difficult it is to write every piece of work on a piece of painted hardboard. There are no worksheets for the children to use, everything is written on the board by the teacher for them to copy out, a time consuming process made harder by the bendy surface and breaking chalk (at least when I was writing it broke!). Other resources were in short supply, children sharing a pencil or having a blunt pencil but nothing to sharpen it with for instance. To this end we are looking at putting together resources for the school which will be sent out in a container by Operation Orphan in July. After school, the children from the homes change out of their uniform and then head for the pump to wash it ready for the next day. While Morag read stories to some younger ones, Cyrilyn and I tried to persuade the children to let us help. It took a lot of persuading but they eventually let us loose with a washboard and soap. My first attempt at a shirt was rejected as the cuffs were still dirty and it wasn’t long before I was on pump duty instead! The water pump is a vital part of the homes along with the roofed outdoor kitchen where meals are prepared. Once washing was done, I started to teach the children to crochet with t-shirt yarn. Never before have I taught 20 people to crochet at once or had it picked up so fast! All started learning to chain and were soon wearing bracelets, necklaces, headbands and belts. About 6 went onto learning other stitches with the intention of making mats – these soon turned into bags with one boy having completed a bag the next morning and done it in a stitch I hadn’t shown him! The children in the other homes also picked up the skills the following day as did 2 of the aunties. The peg weaving loom I showed the senior class at school another day was also picked up very quickly with all the children learning the different skills needed for preparing the fabric, setting up and using the loom and hand weaving sticks. They are very practical, very keen and very creative, the woven mats were also quickly turned into bags (spot a theme here?) with flaps and handles added with no further help from me, as well as headbands, bracelets and belts. One almost guilty pleasure while at Heaven Homes was sitting under a mango tree biting into freshly picked mangoes – never have I tasted anything quite like a mango that has ripened naturally on the tree, still warm with juice dripping. The fibres do get stuck between your teeth, but it’s worth it! The food in general was wonderful, lots of fish, chicken, rice, small cucumbers, plantains and SPICES. We were very well looked after by Sani, Mommy and Titiya – including arguments over who was going to wash our clothes, us or Mommy – she won! By the end of the school week, I was allowed in the kitchen because I was now ‘family’, an honour I do not take lightly – and by Sunday I was allowed to pound the spices for the meal! The bathroom at the house had no running water so we washed with water stored in a large blue plastic barrel. As the level went down we asked about getting it refilled. I tell you, your water consumption goes right down when you realise the children are carrying on their heads from the pump at the school for you! I can now ‘shower’ including washing my hair in 2 colander sized scoops of cold water! The sight of one of the girls carrying a basin on her head while walking along crocheting will remain with me as a highlight, just as the women or yore in Shetland knitted while carrying a kishie of peats on their backs. While we were there, a group of 12 runners arrived having run an epic relay in the UK followed by a marathon run in the heat from Freetown to Heaven Homes – 650 miles in total. It was organised by Michael who had visited Heaven Homes with Operation Orphan last year and wanted to raise awareness and do some fundraising. The children had great fun learning cricket, racing the (tired) runners and playing and singing with them. Some of the runners even had time to paint the nursery yellow, a much brighter look than the original. On the Sunday we had an afternoon at the beach. Mainly occupied by tourists (backpackers tents aplenty) or the more well off from the community. It was a beautiful place with a backdrop of mountains and warm sea water (strange!). We had what had to be the poshest picnic ever with Sani’s spicy fish and cassava leaf eaten off china plates with proper cutlery. There were even glasses for the water. I got in my only bit of shopping at a beach stand (hot, hot sand!) buying a couple of batik bags and a dress. On our last full day, we went around the homes after school giving each child a blanket. Once this was done, with many hugs and smiles the serious part of the day began. We had a water fight. The children ganged up on the adults, throwing buckets of water over Cyrilyn and myself as fast as they could fill them at the pump, also turning treasured empty bottled water bottles into water pistols by piercing a hole in the lid. In the temps there, it was a pleasure to have water chucked over me, although my sandals caused some consternation as the red leather started to bleed its colour and it was thought my feet were bleeding. So much fun and laughter, only possible because of the water supply enjoyed at the homes. A great way to end our stay – although we did have an official goodbye at the school the next day.